Sometime in the late 90s, I got the urge to paint some extracurricular works. Had no set ideas in mind, just a pile of old canvas gathering dust, and lots of jumbo tubes of Acrylic paint that I somehow acquired over the past few years for various projects. 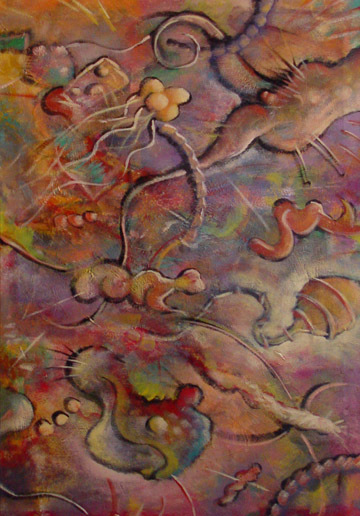 I worked purely in a stream of consciousness mode, painting a bit on this canvas, then switching to another, adjusting, reworking, adding, subtracting. I ended up with about 5 or 6 paintings of various sizes, all pretty similar to the one above. This is the only one that I saved. I never did figure out which side was ‘up’, or whether this would be vertical or horizontal. Addendum: I now remember where all the extra tubes of Acrylic paint came from. Around this same time, I volunteered to paint a mural for my son’s Montessori school in their sixth grade classroom. This was a Natural History timeline depicting various lifeforms througout the different eras, trilobites, dinosaurs, etc. I think I had a lot more ambition than skill in taking on this project, and wasn’t entirely happy with how it turned out, but the school seemed to appreciate it. (It was also kind of fun to paint in front of my son on a daily basis for a few months, as this took place in his classroom). Currently, the original painting resides in my son’s house in Chicago (August 2018). 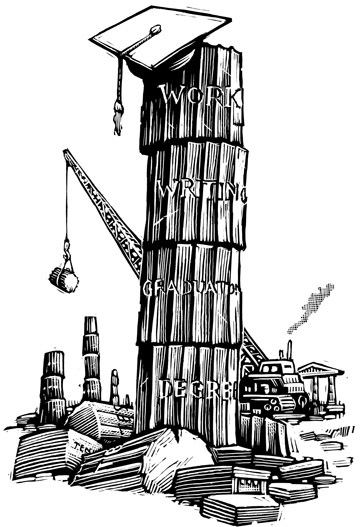 This one was probably for the Chronicle of Higher Education (judging from the mortarboard on top of the pillar), probably sometime in the late 90s, but I can’t find the exact date.